Our horses are alway number one. We ensure our horses are healthy and happy! 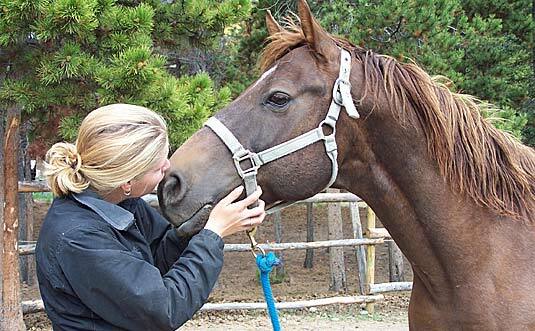 Our horses health is important to us both as our team members and part of the family. Every winter the horses come home from Spirit Lake to our Ranch just outside of Whitehorse where they enjoy 160 acres to roam and stretch out. We grow our own hay and oats for the horses. The horses have regular worming treatments, teeth and foot care which are all vital to overall horse health. Never underestimate the power of grooming! Our horses are groomed daily. Grooming has several functions. Effective grooming not only maintains cleanliness and condition, but as a form of equine massage and it plays an important role in promoting circulation not to mention they love it. A vital part of our horse care, we grown our own hay in the Yukon and supplement with oats. We feed minerals and of course salt year round. Our feeding program takes into consideration the individual horse. Their age, weight, workload and temperament. A horse should be fed approximately 2.5% of its body weight daily. Horses are like people some we call easy keepers as they just look at food and put on weight they are usually put in the DIET pen. Other horses are harder to keep weight on and they require special diets, like us they are individuals and we must take each horses individuality into consideration when planning the feeding program. • Always provide salt "free choice"
We use western saddles which have a large pommel and are generally considered to be most comfortable for long hours in the saddle. They also support a more relaxed and "behind the motion" position. We use a blanket and pad for the horse's protection. We use a snaffle bit for our trail horses. It is considered to be the lightest bit available and in our opinion the most effective with well trained horses. Each horse is groomed and brushed prior to getting saddled. Part of the routine includes picking their hoofs and ensuring their hoofs are clean and void of any rocks or debris. The horses enjoy being groomed and having their hair done, just like we do. Spirit Lake Wilderness Resort 2003-2007 All Rights Reserved.